Though she’s glad to have Grandma back in her life, Wren’s sleeping on the couch in her own house now . . . and worried about the expenses piling up. After all, her job at the community library is in jeopardy after budget cuts, and the fancy music program she wants for her son is getting farther and farther out of reach. What’s more, Paul—the guy she's drawn to yet avoids—ends up being a major part of an important library project. With family arriving and old wounds resurfacing, Wren’s about to fly when she discovers something special—a gift of grace beyond her wildest dreams. When I first saw the cover and Sheila Walsh's name... I couldn't get this book fast enough! 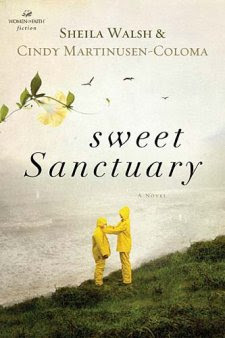 I absolutely love books that are set on the coast and I pretty much love anything written by Sheila Walsh. So put the two together and I have to read it! Sheila Walsh and Cindy Martinusen-Coloma did a wonderful job of making the story realistic. I was drawn when I first read what the story was about. As a single mother myself for 12 years, I could easily relate to the struggles of being a single parent. Trying to make ends meet, wanting the very best for your child, divorce.... all things we may all be familiar with. Throw in a good mix of family members... a Grandmother and estranged siblings... and I can easily connect with Wren. I'm loving her children's stuff for little girls. I'm curious what I would think of her writing for us big girls. Back to School ... Pray!